P G Tenzing, the Kerala-cadre IAS officer who quit his job to go on a 25,320-km motorcycle ride across India, died of cancer in his hometown Gangtok on Monday. He was 46. Kickstarting what he called his “karmic journey” from Thiruvananthapuram, Tenzing rode across states, making quick roadside friends, observing the quirks and quiddities of people and places and revisiting the cities he had worked in in the past. The 1986-batch IAS officer had held several key posts in IT, Education, Fisheries and Transport in Kerala. Tenzing had played a crucial role in inking the Smart City project with Dubai-based TECOM. Tenzing is survived by wife Ambica, a Sikkim-cadre IAS officer, and two daughters. 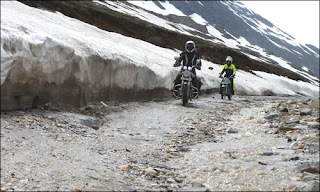 GANGTOK (SIKKIM) : P G Tenzing, the Kerala-cadre IAS officer who quit his job to go on a 25,320-km motorcycle ride across India, died of cancer in his hometown Gangtok on Monday. He was 46.Tenzing studied at Delhi University. He was in the Kerala cadre of the Indian Administrative Service for twenty years. His colleagues said of him, as he embarked on his adventures: 'Philosopher, eccentric, drinking companion, fitness freak, party animal, secret workaholic, visiting professor, reluctant officer, successful hotelier and great friend of Tenzing, who joined the civil service at the age of 22, opted for voluntary retirement in 2007. 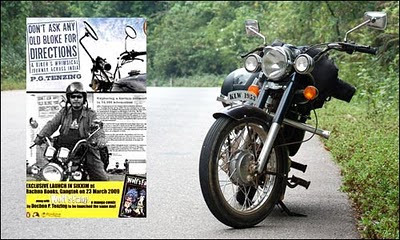 The former higher education secretary of Kerala then bought a green 350 cc Enfield Thunderbird, strapped on it a rucksack that contained three pairs of clothes, a few thousand rupees, an ID and ATM cards, and went on a nine-month road trip. On what made him quit the IAS, Tenzing had said, "I am following my heart. I was tired working under bosses who ought to have been shooed and I had to 'Sir' them." In his travelogue Don't Ask Any Old Bloke for Directions, published by Penguin last year, Tenzing was more eloquent. "I had always wanted to travel at random and with only myself for company," he wrote. "Watching my hair grow without combing it. Watching the sunrise and sunset from sea level and from the heights of the Himalayas. Getting my face burnt and my toes wet." His former colleagues in Kerala remember him as an honest officer, sympathetic towards anyone in need. Recalls Chief Minister's Principal Secretary Sheela Thomas: "Tenzing was a fun-loving person. Even when he was engaged in serious matters, he projected a jovial face." She said his colleagues tried to dissuade him from quitting, but Tenzing thought 20 years in service were more than enough. Prita Maitra, who was an editor at Penguin India, recalls her introduction to the bureaucrat-turned-adventurer and how the book came about: "In 2007, a journalist friend told me about this amazing person who had quit the IAS and was undertaking a motorbike trip all around the country to acquaint himself with places he hadn't seen. Naturally, there was a book there and less than a year after the decision to write it, he served up this perfectly delightful account of his experiences. He was a person with a great sense of humour and he was extraordinarily generous and sensitive. His book reflects all that. His description of travelling around his home state, Sikkim, was the most moving." The 1986-batch IAS officer had held several key posts in IT, Education, Fisheries and Transport in Kerala. Tenzing had played a crucial role in inking the Smart City project with Dubai-based TECOM. Tenzing is survived by wife Ambica, a Sikkim-cadre Civil Service officer, and two daughters. For many a reader, it was an interesting travelogue written by someone who left a high-profile job to experiment with something new on road. But for those in bureaucracy, the book is also a whimsical journey into the sidelights of both boring and exciting life of men in corridors of power. Here is a tribute to Tenzing who died of cancer on July 26. He is survived by his wife, also a bureaucrat and daughter Dechen Tenzing who has emerged as a talented cartoonist. After twenty years in the Indian Administrative Service, P.G. Tenzing throws off the staid life of a bureaucrat to roar across India on an Enfield Thunderbird, travelling light with his possessions strapped on the back of his bike. 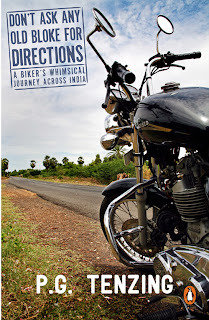 On the nine-month motorcycle journey without a pre-planned route or direction, he encounters acquaintances who appear to be from his karmic past: from the roadside barber to numerous waiters and mechanics— fleeting human interactions and connections that seem pre-ordained. Life on the road is full of pot holes in more ways than one, but Tenzing acquires a wheelie’s sixth sense. He is unfazed by suspicious hotel receptionists or other unkarmic sceptics who take one look at his dishevelled, unkempt appearance and ask for an advance, or a deposit or both. Tenzing’s views on life and death, friendship and love are informed by a certain dark humor. But his conviction that everything revolves around the sacred bond that humans share with each other and with the universe is deeply felt and inspiring. Sometime singer with a Gangtok band, a dabbler in vipassana meditation and a supporter of a monk's school at Mangan, Sikkim, P.G. Tenzing is self-confessedly at a mid-life crisis point and ready for all the adventures this world has to offer. Exploring a karmic network in 25,320 kilometers After twenty years in the Indian Administrative Service, P.G. Tenzing throws off the staid life of a bureaucrat to roar across India on an Enfield Thunderbird, travelling light with his possessions strapped on the back of his bike. On the nine-month motorcycle journey without a pre-planned route or direction, he encounters acquaintances who appear to be from his karmic past: from the roadside barber to numerous waiters and mechanics— fleeting human interactions and connections that seem pre-ordained. Life on the road is full of pot holes in more ways than one, but Tenzing acquires a wheelie’s sixth sense. He is unfazed by suspicious hotel receptionists or other unkarmic skeptics who take one look at his dishevelled, unkempt appearance and ask for an advance, or a deposit or both. Tenzing’s views on life and death, friendship and love are informed by a certain dark humour. But his conviction that everything revolves around the sacred bond that humans share with each other and with the universe is deeply felt and inspiring. Sometime singer with a Gangtok band, a dabbler in Vipassana meditation and a supporter of a monk's school at Mangan, Sikkim, P.G. Tenzing is self-confessedly at a mid-life crisis point and ready for all the adventures this world has to offer.